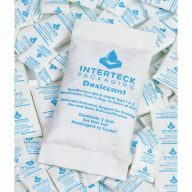 Interteck’s Unit Pak line offers drying applications for all size packaging. These Unit Paks meet or exceed MIL Spec 3464, Type I & II. A “”unit”” refers to a Military Specification for packaging. The term “unit” is a quantity of desiccant, which will absorb a set percentage of its weight at certain levels of humidity. For convenience, one “unit” is approximately equal to one ounce.